Despite these characteristics, misleading diagnoses and inadequate treatments of NPDC have been described in the literature, thus pointing out the importance of detailed analysis of this pathology, by means of imaging analysis tools and specific software, such as three-dimensional reformatting of bone structures and soft tissues. This enables the dentist surgeon to evaluate the lesion thoroughly, thus providing surgical predictability and higher likelihood of success. Therefore, the objective of this article is to report a case of NPDC in which a combination of different imaging modalities was used to assist in diagnosis, treatment planning, and postoperative follow-up of lesion. Panoramic radiograph of a 20-year-old female patient, taken for orthodontic purposes, showed an asymptomatic radiolucent heart-shaped area near the apices of the upper central incisors [Figure 1]a. Cone-beam computed tomography (CBCT) was ordered, showing a hypodense area in the anterior maxillary region with expansion of cortical bone along the nasopalatine duct canal [Figure 1]b. In addition to these examinations, the patient also had been recently submitted to magnetic resonance imaging (MRI), with T1-weighed images showing internal intermediate signal of the lesion as well as homogeneity, indicating the absence of internal calculi (e.g., fatty content). However, sequential images showed hypersignal area delimited by intermediate and hyposignal areas, suggesting liquid content compatible with cystic fluid – with consequent differentiation from tumoral lesion on T2 [Figure 1]c.
In this way, the diagnostic hypothesis of NPDC was raised, and considering its proximity to adjacent structures, three-dimensional reformatting of the region was performed using InVesalius software (Center for Information Technology Renato Archer, Campinas – São Paulo – Brazil). Manual segmentation was used and skeleton automatically generated based on predetermined thresholds. It was possible to observe volume, extension, and positioning of the lesion [Figure 2]a, [Figure 2]b, [Figure 2]c by increasing the bone transparency, which corresponds to its morphology. This allows having surgery predictability as the largest volume of the lesion was near the nasal fossa. By knowing the localization and size of the lesion, it was suggested to perform enucleation as a form of treatment. Surgical procedure was initiated under local anesthesia for access to anterior palatine region through flap elevation and osteotomy between the first premolars. Next, the lesion was displaced and removed. In the end, suture was performed to close the surgical wound [Figure 3]a, [Figure 3]b, [Figure 3]c.
The patient was medicated with analgesics and antibiotics, in addition to being instructed on postoperative care. The removed material was sent for histopathological examination [Figure 3]d, which showed that the lesion consisted of soft tissue fragment measuring 12 mm × 4.0 mm × 4.0 mm and exhibited elongated shape, irregular surface, blackened color, and fibrous consistency [Figure 3]d.
Histological sections [Figure 4]a and [Figure 4]b revealed fragment of cystic capsule consisting of dense connective tissue lined by simple cubic epithelium and ciliated pseudostratified epithelium in certain areas. Blood vessels, clots, and adipose cells were observed within the cystic capsule. Fragments of mineralized tissue completed the picture and confirmed the diagnosis of NPDC. 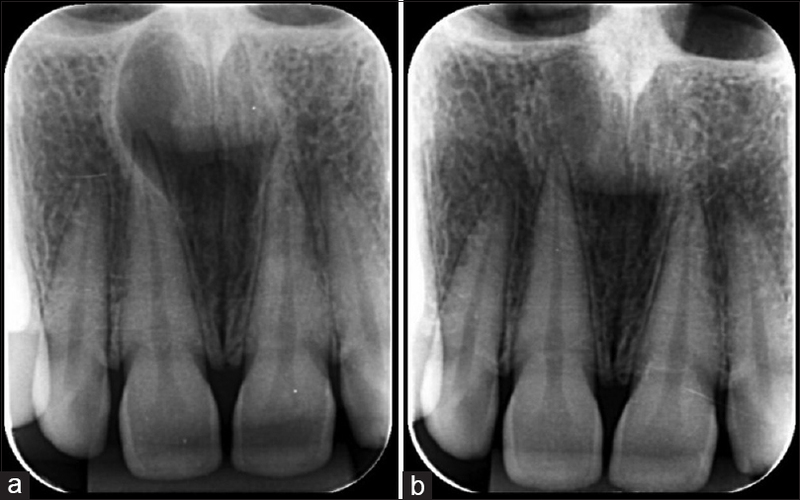 Radiographic follow-up showed satisfactory bone repair, continuity of lamina dura, and normal periodontal ligament space in the teeth involved. The heart-shaped area was observed in detail, which was explained by the superposition of the anterior nasal spine [Figure 5]a and [Figure 5]b.
Histopathological findings vary depending on the proximity of the lesion to oral or basal mucosa since one can observe stratified-squamous or pseudostratified columnar (ciliated or caliciform) epithelium, as well as simple columnar or simple cuboidal type.,, Morphologically, the cystic wall is lined by innervated and vascularized fibrous connective tissue., In addition, hyaline cartilage, mineralized tissues, and cholesterol crystals could also be found., Therefore, the histological findings in the present case corroborate the literature on this lesion. Despite being benign and having a limited development, NPDC can cause excessive osteolysis in association with hemorrhage, dehiscence, buccosinusal communication, and damage to sensorial nerves of the region., The three-dimensional study of the lesion can assist in overcoming such complications during the treatment, which consists of enucleation or marsupialization. Therefore, CBCT allows for analysis of the site affected by the lesion in detail and at low-radiation dose., In this case, we have also opted for a topographic reproduction of the lesion by using InVesalius software, which is a free-use tool enabling visualization of NPDC in terms of area and volume, including its relationship with vascular-nervous bundles and nasal floor. With a grounded surgery planning, one can preserve the vitality of the teeth and sensorial activity of anterior palate. The different imaging modalities combined with clinical examination have allowed us to obtain a well-grounded differential diagnosis before an invasive procedure, and their association with histopathological examination resulted in accurate diagnosis. 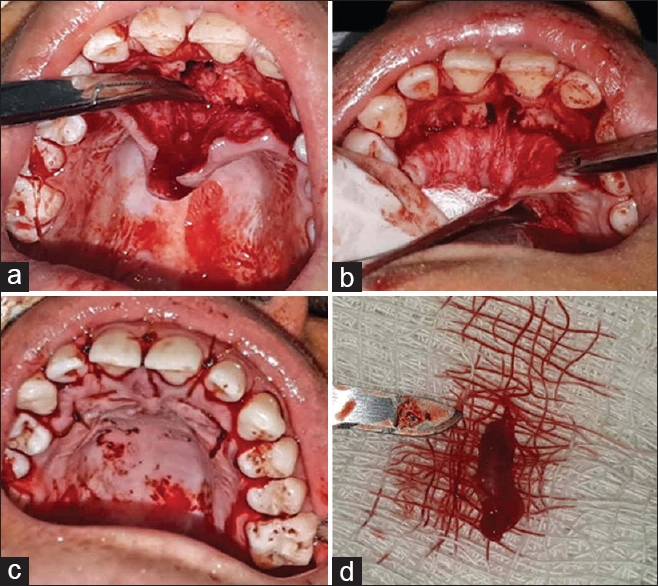 In the present case report, volumetric reformatting of the lesion was crucial for a successful treatment as it prevented surgical complications and allowed for maintenance of vascular-nervous activity in the region. The authors certify that they have obtained all appropriate patient consent forms. In the form, the patient has given her consent for her images and other clinical information to be reported in the journal. The patient understands that her name and initials will not be published and due efforts will be made to conceal identity. For the elaboration this article, the authors didn't have any financial support or sponsorship. Gomes JP, Costa AL, Chone CT, Altemani AM, Altemani JM, Lima CS, et al. 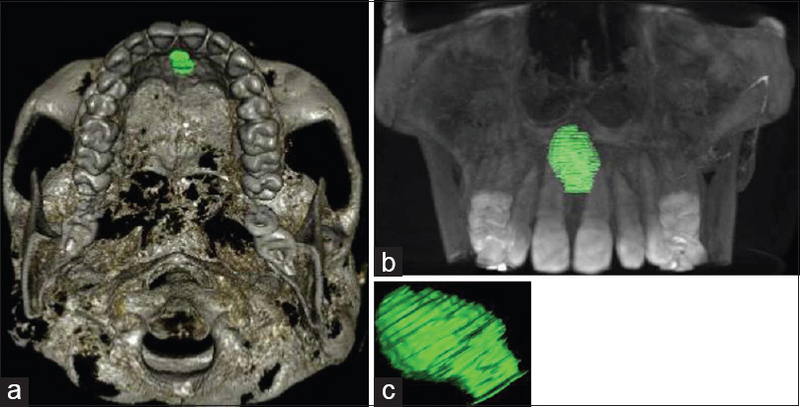 Three-dimensional volumetric analysis of ghost cell odontogenic carcinoma using 3-D reconstruction software: A case report. Oral Surg Oral Med Oral Pathol Oral Radiol 2017;123:e170-5. Barros CC, Santos HB, Cavalcante IL, Rolim LS, Pinto LP, de Souza LB, et al. Clinical and histopathological features of nasopalatine duct cyst: A 47-year retrospective study and review of current concepts. J Craniomaxillofac Surg 2018;46:264-8. Allard RH, van der Kwast WA, van der Waal I. Nasopalatine duct cyst. Review of the literature and report of 22 cases. Int J Oral Surg 1981;10:447-61. Tsuneki M, Maruyama S, Yamazaki M, Abé T, Adeola HA, Cheng J, et al. Inflammatory histopathogenesis of nasopalatine duct cyst: A clinicopathological study of 41 cases. Oral Dis 2013;19:415-24. Shylaja S, Balaji K, Krishna A. Nasopalatine duct cyst: Report of a case with review of literature. Indian J Otolaryngol Head Neck Surg 2013;65:385-8. 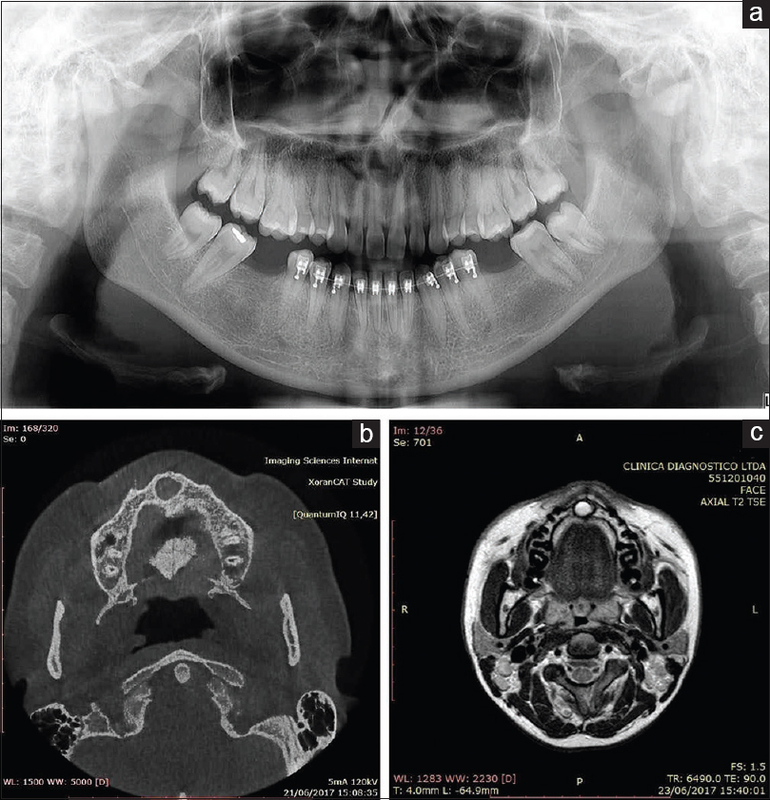 Aparna M, Chakravarthy A, Acharya SR, Radhakrishnan R. A clinical report demonstrating the significance of distinguishing a nasopalatine duct cyst from a radicular cyst. BMJ Case Rep 2014;2014. pii: bcr2013200329. Hisatomi M, Asaumi J, Konouchi H, Matsuzaki H, Kishi K. MR imaging of nasopalatine duct cysts. Eur J Radiol 2001;39:73-6. Tanaka S, Iida S, Murakami S, Kishino M, Yamada C, Okura M, et al. Extensive nasopalatine duct cyst causing nasolabial protrusion. Oral Surg Oral Med Oral Pathol Oral Radiol Endod 2008;106:e46-50. Suter VG, Warnakulasuriya S, Reichart PA, Bornstein MM. Radiographic volume analysis as a novel tool to determine nasopalatine duct cyst dimensions and its association with presenting symptoms and postoperative complications. Clin Oral Investig 2015;19:1611-8. Pinto AS, Costa AL, Pinto MC, Braz-Silva PH, Moraes ME, Lopes SL. Characteristic MRI and cone beam CT findings in a case of paradental cysts arising in the bilateral retromolar regions of the mandible. Oral Maxillofac Radiol 2016;4:83-6.